Four Months Old and an Update on Skye!!! I've been a bit remiss in updating my blog.......been super busy, but things are getting back to normal. On the 26th the puppies were 4 months old!!!! I've been with them everyday and it's really strange now to just have one. She's got a good application for her so soon there will probably be none. She was set up to see a new family yesterday....but has had a few tummy problems....so we wanted to make sure Milly is okay before she goes to her new place. Here are a couple of pictures of her yesterday with Mom. She was feeling much better this morning....and back to eating. I miss the babies, but I know that they are in good homes.....as soon as I get some more pictures I will update all of them. I also wanted to talk about Skye. She was a sweet girl that we had in our program for a long time.......no one seemed to be interested. About two months a couple came over with their older dog and wanted to look at a couple at two of our younger girls. 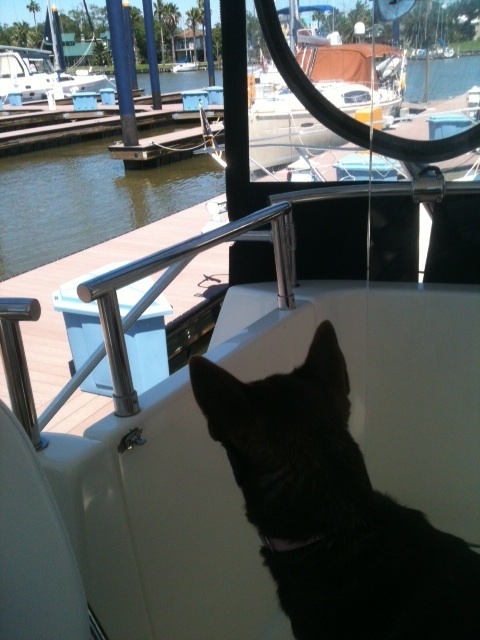 Our director and I talked about it and decided to bring out Skye first.......even though they hadn't asked to see her. We thought because of their dog's age.....and the fact that Skye is very laid back this might be a better match. 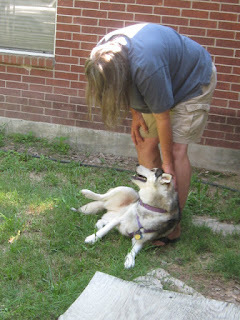 Skye came out and rested her head on Dad's leg and they immediately formed a bond. 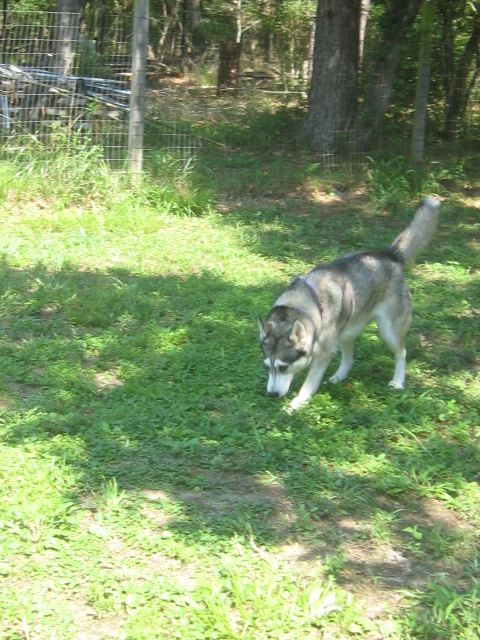 There was no friction with the other dog.....what we were hoping for.....and she followed him all around the yard. After a bit I knew I would have to bring out the other two girls.......those were the ones they wanted to see after all!!! I put Skye up and let out the other two, one by one, but they were both too hyper, and too young, for their dog and for them. In the end Skye got a wonderful new place to go....and we did make the right choice to show her. I'm the happiest girl in the world!!!!! I'm so happy for my girl......you have a great life ,Skye!!!!! 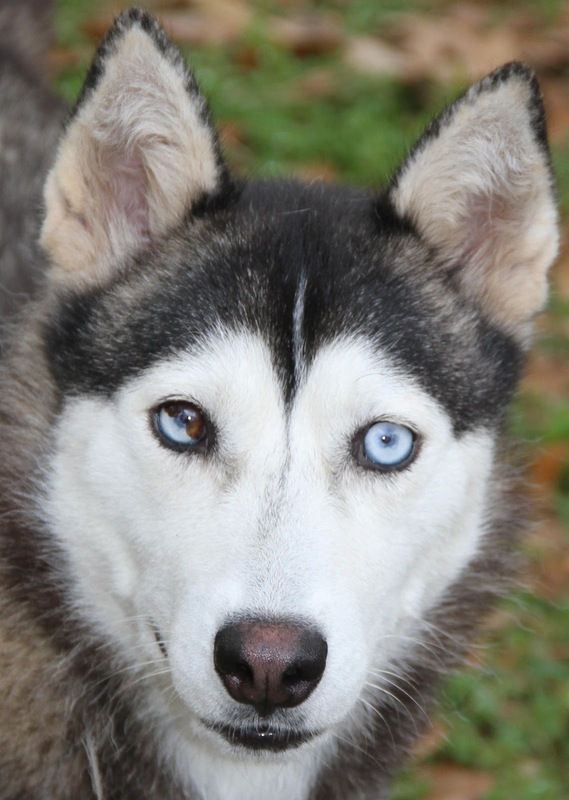 If you can help one of our beautiful babies , please go to www.huskyhaven.org and consider adopting, fostering or making a donation!!!! So, I talked about her yesterday Miss Mal is Meeshka. Wanted to say as a rescuer/foster I want to have my girl go to the most perfect family. Check out the photos....my girl is a princess!!!! Always cross my legs, I'm a proper girl!!! I'm not so proper when I sleep!!! 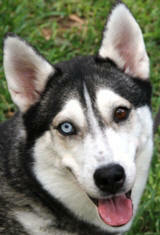 Husky Haven has been doing well these days with our adoptions. Pet Expo helped and I think the economy is a bit better than it has been for the last few years........whatever it is I hope it continues!! These are three of the dogs that have gone to great homes. Adam was in our program for a few years. He has storm fright and the first couple that adopted him didn't crate him during a huge storm, let's just say it wasn't pretty........so he came back to us. He was such a sweet boy.....but just no interest. A couple of weeks ago a couple came to see some of our white dogs, particularly Adam and Iceman, since both have storm fright. They wanted to work with one of the dogs , see if they could help. They took Adam home and basically adopted him that day. We did have a storm right after that, he had problems, but this couple is very understanding and he has a fantastic new home!!!! You can see he's having a wonderful time......my dogs never pay attention to the TV, but they say he sits like this for a half hour or more!!!! We wish him the best new life!!!! Whitney was the little girl that came to us emaciated, 20 pounds underweight, that we had to hand feed. She also had the start of distemper and we got her through that!!! This is what she looked like in February.......we didn't even get her on the website till later......didn't know if she was going to make it. With my new running buddy, Koda!!!!! 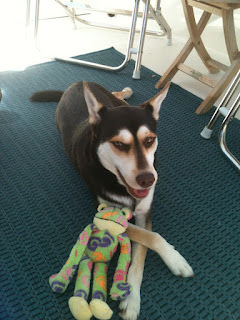 Here's what she looked like last week with her new brother , Koda!!! We are so happy she got a great home.....and happy she has a new chance to begin her life!!!! You will be missed little girl!!! Mallory was my foster for about three months. 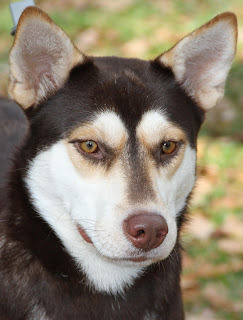 She was a mini Husky and she fit in well with my three dogs. She had a ton of interest at Pet Expo......because of her size and temperament. I talked to many couples that wanted her and was happy to note we had a bunch of applications that evening. One couple stood out to me and they were the ones Mal and I picked. They had lost their dog a few months before.....and were not thinking to get a dog right then.....but they fell in love with Mal. That next week she went to her amazing new home. I know she has been on a boat and had other adventures already. I'm so happy she is with someone who will love her and not discard her. 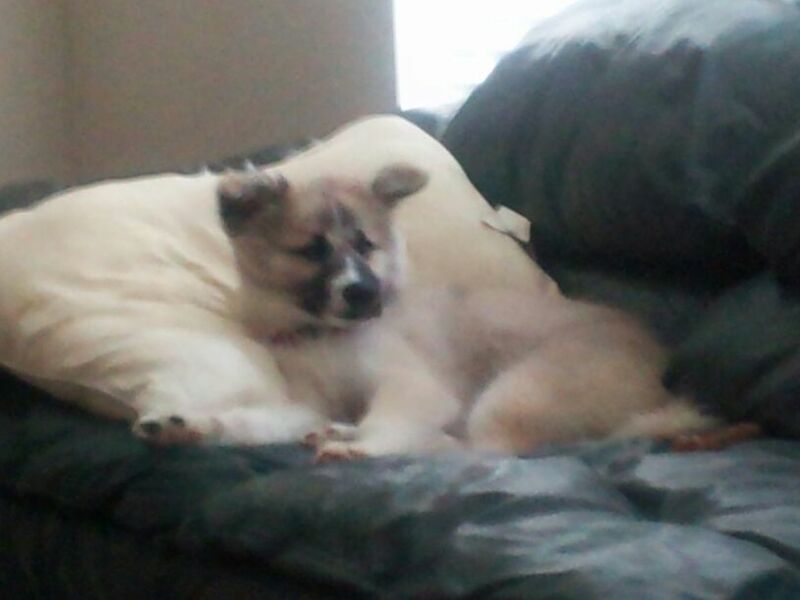 One last picture of her relaxing on my couch.......Love you Mal....have an awesome new life!!!! We have a lot of other sweet, deserving Huskies......please check them out , and if you can donate we appreciate it........www.huskyhaven.org. Till next time!!! My sweet girl Lilly got adopted today!!!!!! 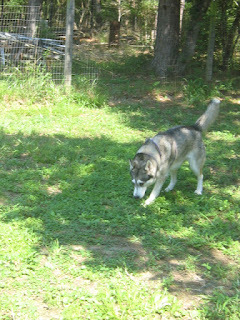 She was my absolute favorite......didn't look a ton Husky.....kinda different color......but the most wonderful girl you will ever know!! A family that adopted from us a few years ago was looking on the website and saw we had some puppies.....and Lilly was close in color to their girl. The two had a meet and greet today and absolutely no problems!!! Her new sis, Jersey, did teach Lilly how to run through mud puddles......so good luck with that Mom and Dad!!!! I will , of course, miss her.....along with the other babies......but I know that everyone has gone to a great home!!! Love you girl!!! Doing what I do best, give kisses!!!! The new family portrait.....Mom, Dad, Jersey and me!!!!! I think that Milly may be spoken for also.......then all of our babies will have gone to wonderful, safe and loving homes!!! 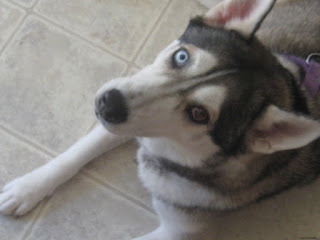 But there is no shortage of Huskies.......please go to www.huskyhaven.org to check out our other deserving kids!!!!!! So now we are down to just two little girls......Milly and Lilly!! Our two boys , Billy and Willy got adopted in the last couple of weeks!!!! Billy went home with a mom and her 14 year old son and Willy was adopted by a couple that had dogs from us before. As sad as I am to see them go......I'm also happy that they found wonderful homes. The boy was playing ball with Billy while his mom filled out paperwork......I know he is going to be so happy to have a new friend!!!! I'll miss it here....but I'm gonna have a lot of fun!!! Willy is off to his great new home...as you can see from the picture....he is very comfortable there!!!! Thanks guys for taking care of this great boy!!! I think I'm gonna like this!!!!! We are so very happy for these kids......love you boys!!!! Sorry son....no parking in the garage this weekend!!!! And this is how it looked all day!!!!! I'm not one for garage sales......just never go to them......I really don't like to have them either.......but once every couple of years is okay. We did make a lot of money and Husky Haven is super happy!!!! I have to give a shout out to the greatest girls ever....Barb, Becky, Donna M, Cyndii and Lauren. They worked tirelessly all day to make this work........thanks a ton ladies!!!!!! On to a wonderful adoption.......our beautiful girl Amber was adopted by our friend Donna. 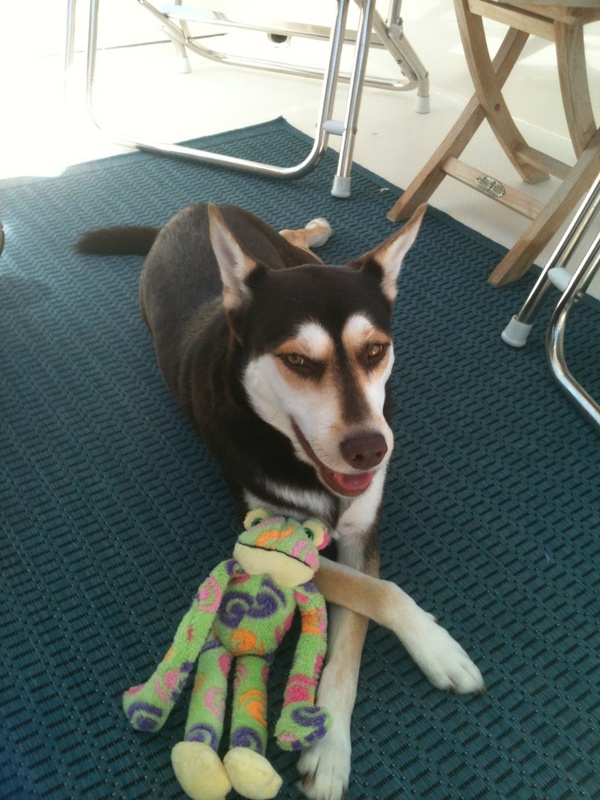 Amber was rescued from animal control late last year along with her three puppies. Unfortunately, Amber had those puppies outside after she'd been dumped......they had been living in a culvert when animal control picked them up. The puppies were in bad shape and turns out they had distemper.....they didn't last long. Amber had distemper too.....but we managed to get her to a doc in town that gives a new vaccine.......it works as long as the dog has no neurological damage. Luckily she was in early stages and after a few days felt better and started eating again. 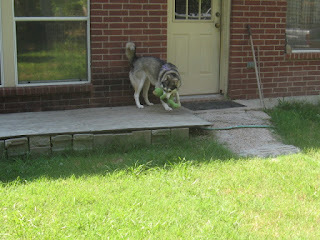 She is such a sweet little mini Husky and I know Donna will be the best mom. 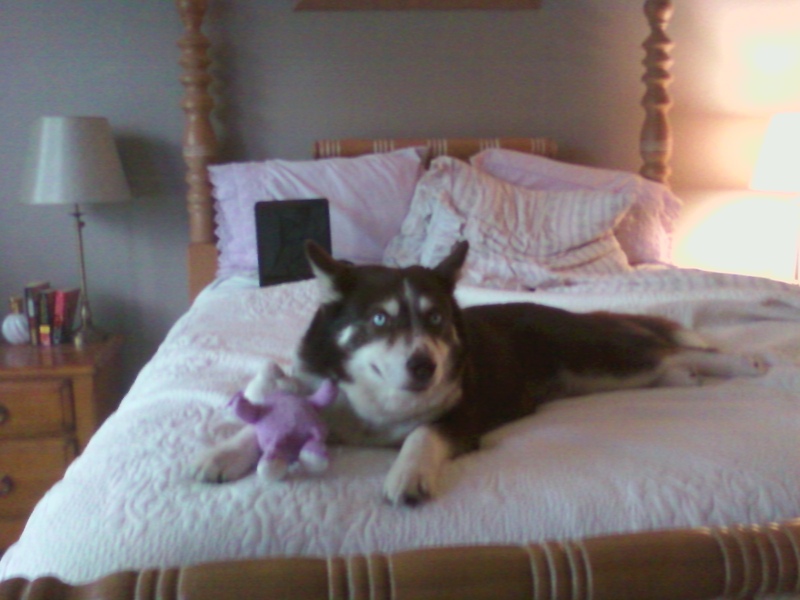 Love your bed and my new home, Mom!!!!!!!! When we were at Pet Expo a couple of weeks ago we really got a lot of good applications from that show. I haven't posted about all our adoptions....but I am going to talk about one now. An older gentleman , that had adopted from us before , came to talk.......he was looking for a smaller Husky.....around 30 to 40 pounds.....both he and his wife are in their mid-seventies and didn't feel they could handle a 60 pound dog anymore. We have a poster with our adoptable dogs on it....he asked me the weight on each one. He actually sent an application that day and Tuesday evening was there to look at dogs. I'm happy to report he picked Lil , she was another mini-Husky....weighing in at about 40 pounds. Another successful and happy adoption!!!!! Mom....is it time to eat?????? TJ and Lizzy in their usual afternoon configuration!!!! For the next year it was the three of us.......I was working a lot.....knew at that point I really didn't have time for another foster or another dog. In 2010 things calmed down at work a bit....but I really wasn't ready for a new housemate. Of course all that was about to change. In early May 2010 some Husky Haven volunteers were driving down a multi-laned highway and spotted a black dog sitting on the side of the road. When they pulled over they realized he had his tags and his leash on....they assumed he had escaped!! They called the number on his tags....over and over in fact.....no return call. They kept him for a couple of weeks then asked me if they could take him to a small outdoor show we were doing.....see if they could drum up some interest. At the show that day, Tank basically sat a my feet and stared at me.....I knew I was in trouble!!!! Within a couple of weeks I had dog number three.......and he fits perfectly with my Huskies. When I took him to the vet the first time, they told me he was about 6 years old........never understand how you could dump a family pet after so long!!!!! Thanks for the super scary eyes Mom!!!!! !